We rushed to get this up right away, because we'd love to invite you to "Help Document the World's Story" on Friday, 11.11.11. Video, photography, multimedia projects need to be created on this Friday, then uploaded to the One Day on Earth site as soon as possible. 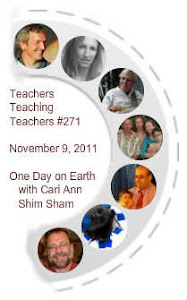 On this episode of Teachers Teaching Teachers we are joined by Cari Ann Shim Sham, who ends this webcast by reminding us that participation in this project is "Easy! Just tell your students about the Web site." Check out the Education Toolkits that Cari Ann and her colleagues created. This week's participants included: Chris Sloan, Monika Hardy, Fred Mindlin, Cynthia Shidner, Shantanu Saha, and Paul Allison. We'll see you over at One Day on Earth. If it’s November, it must be time for the National Writing Project’s (NWP's) Annual Meeting. This week, many Writing Project teachers from across the United States (and some around the world) will be gathering in Philadelphia, Pennsylvania for our annual conference. In connection with the National Writing Project's Annual Meeting, we invited a few teachers who will be presenting in Philadelphia to join us on this episode. Paul Oh, an associate with the NWP joined us as well. In addition, this same cast of characters will be joining us for a follow-up show after the Annual Meeting on December 2. As presenters of Annual Meeting sessions that focus on 21st century literacies, these writing project teachers and colleagues shared stories about the exploration of new composing practices, especially podcasting and video-making. Robert and Chuck teach 4th graders and Joe teaches 6th graders. It was and exciting, informative show.